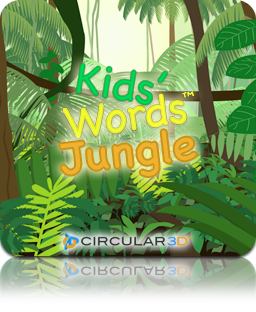 Kids' Words Jungle is the free version of the Kids' Words series. This app is great for parents and teachers that want to try out Kids' Words, an educational game for children learning words. Kids are presented with 10 words per word set and must choose the correct letters to complete the word. Each word is recited both before and after a spelling attempt. The free version of the app comes with 1 word set to practice. Up to 3 word sets for a total of 30 jungle words can be purchased as an add-on.